Prepare the noodles by placing them in a medium size bowl and pouring enough warm water to cover them. Set aside for 15 minutes. Heat the coconut oil with spices over a gentle heat for about 2 minutes or until fragrant. Add the sliced shallot and fry for a minute. Next add the stock and the coconut milk and bring to a gentle simmer. Add the chicken cooking for 3 to 5 minutes or until it appears cooked and not pink inside. Lastly add the noodles. Serve in bowls with a handful of sprouts, a little fresh coriander and a sprinkle of dulse flakes if you desire. 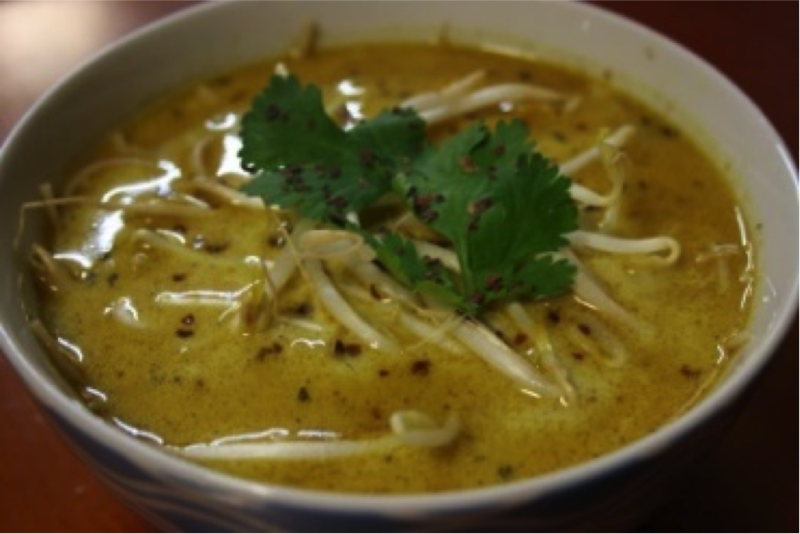 *Laksa Lemak mix from gewurzhaus- Candlenut, coriander, shrimp, lemongrass, galangal, chilli, salt, garlic, turmeric, coriander leaf. You could use blend of ½ tsp coriander, 1tsp turmeric, ¼ tsp chilli, pinch of salt, ¼ tsp garam masala. Or even just a tbsp. curry on its own will give you the flavours.